If current trends continue, a baby girl born today will only see the gender gap in health, education, economic opportunity and politics completely close around the world if she lives to 83. That’s the stark finding of the World Economic Forum’s Global Gender Gap Report 2016. The report shows that there remain huge differences in the opportunities for women in the best and worst performing countries around the world. The top 10 continues to be dominated by smaller European countries, particularly Nordic nations, which occupy the top four positions. Compared with the world average, the leaders of the index perform particularly strongly in the Political Empowerment category, with all countries ranking in the top 20. 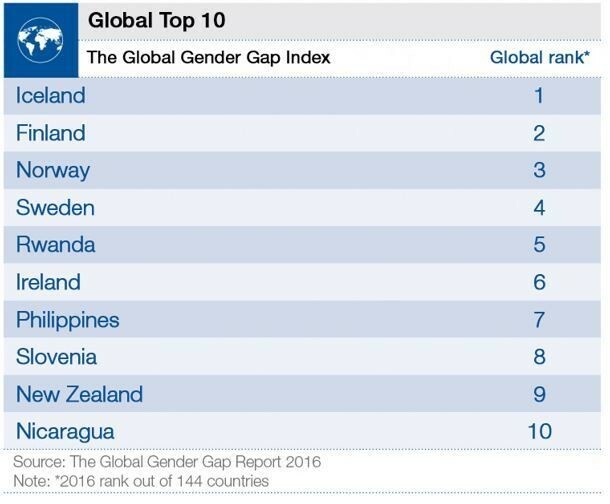 It is the eighth year in a row that Iceland has taken the top spot, closing more than 87% of its overall gender gap. It remains the top performer on Political Empowerment and is in the top 10 on Economic Participation and Opportunity on the back of solid improvements in the number of women among legislators, senior officials and managers. Finland overtakes Norway and regains its second place in the world, closing nearly 85% of its overall gender gap. It has fully closed its gender gap on Educational Attainment and Health and Survival, and remains the runner-up on Political Empowerment, reaching parity in the number of women in ministerial positions. Rwanda crosses the threshold of closing 80% of its gender gap and overtakes Ireland to break into the top five for the first time since entering the Index. It remains the country with the highest percentage of female parliamentarians in the world, at 64%. And Nicaragua re-enters the Index top 10 for the first time since 2014. It remains the best performer in the Latin America and the Caribbean region for the fifth year running. 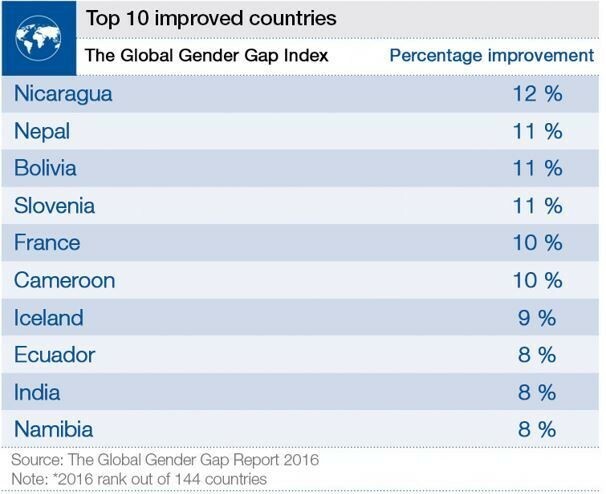 In fact, Nicaragua tops the most improved list, too, ahead of Nepal and Bolivia. It has fully closed the gender gap on the Educational Attainment and Health and Survival indexes, and ranks fourth in the world on Political Empowerment, with more than 50% of its political gender gap now closed. Nepal has made notable improvements on the Political Empowerment index, as well as on literacy and wage equality. And while Bolivia records a slight decline in female labour-force participation, it has reached parity in the number of women in parliament and has fully closed its Health and Survival gender gap. There is some positive progress and some worrying regression highlighted in this year’s report. The economic gender gap this year has reverted to where it stood in 2008, after a peak in 2013. On the other hand, on current trends, the education-specific gender gap could be eradicated within the next 10 years. The report aims to provide an accurate picture of the global situation each year, shining a light on areas of success as well as highlighting areas where significant work needs to be done.